Most silver jewelry is signed with at least two marks, one for the artisan, company or studio that made it (maker's mark) and another to denote its silver content (assay or purity mark). 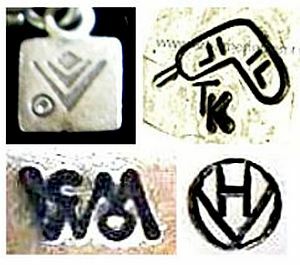 Silver jewelry makers' marks are usually in the form of a pictorial logo or initials and the vast majority are well-documented and often officially registered as authentic trademarks. In most cases, these marks vary over time and with proper identification they can provide solid clues as to the period a certain item was made. Assay or purity silver marks can be as simple as a word, e.g. STERLING, or a number, e.g. 925, or even the official Hallmark of the country of origin. Identifying silver marks on jewelry is essential for appraising their value. Design and style aspects are also key as some jewelers are more popular or famous than others. To learn more about our silver & jewelry identification research services, please check out our marks reference guide - marks4silver - to gain unlimited access to the most comprehensive and updated list of worldwide identifying silver & jewelry hallmarks and companies' trademarks. Our experienced specialists can also answer your questions directly for free when you need some extra guidance or have doubts (members only). In addition to pages for marks & hallmarks, our research tools also include a price guide to help you appraise your collection and be certain that you are not paying high when buying or asking too low when selling. Below are a few examples. Lot of Sterling Silver Jewelry; charms, pins and a few extra items!